Franklin D. Roosevelt, thirty-second president of the United States, led the nation out of the period of economic crisis known as the Great Depression (1929–39) and later into World War II (1939–45). Before he died, he cleared the way for peace, including the establishment of the United Nations. Franklin Delano Roosevelt was born on January 30, 1882, into a well-known family. The Roosevelts had been fairly wealthy for many generations. The family had often been important in the civic affairs of New York. When Franklin was born, his father was fifty-one years old and his mother was twenty-eight. As his parents' only child, he did not have to compete with other siblings for their attention. Tutors and governesses (female, live-in teachers) educated him at home until he was fourteen. At this time he attended Groton School, which educated boys of the upper class. The young Roosevelt was thus surrounded by privilege and by a sense of social importance from an early age. His family traveled in elite (high-society) circles, and he even visited the White House to meet President Grover Cleveland (1837–1908) when he was five years old. As a young man, Roosevelt attended Harvard University in Cambridge, Massachusetts. While living in Cambridge, he met and decided to marry his cousin, Eleanor Roosevelt (1884–1962). The couple married in 1905. At that same time Franklin entered the Columbia University Law School. He became a lawyer and took a job as a clerk in a New York firm. However, he took his duties there lightly. It was later recalled that he had told other clerks that he intended to enter politics and eventually become president. Roosevelt's opportunity came in 1910. He accepted the Democratic nomination for the New York Senate and was elected. He was reelected in 1912, and that same year Woodrow Wilson (1856–1924) was elected president of the United States. Roosevelt had worked to support Wilson's run for office, and his efforts were noticed by the important Democrat Josephus Daniels (1862–1948). When Daniels became secretary of the Navy under Wilson, he persuaded Wilson to offer Roosevelt the assistant secretaryship. Roosevelt soon became restless in his new position, and he decided to run for the Democratic nomination for U.S. senator of New York. Wilson and Daniels were not pleased, and afterward President Wilson never really trusted Roosevelt. This distrust increased when Roosevelt disagreed with the Wilson administration's policy in the years preceding World War I (1914–18), the conflict that pitted Great Britain, France, Russia, Italy, and other countries against the forces of Germany, Austria-Hungary, and others. Wilson wanted to remain neutral—he wanted to keep the United States from taking sides in the war. Roosevelt openly favored greater engagement in the war. When America finally did enter the war in 1917, Roosevelt worked for a cause he believed in. with the treaty's final terms. Many Americans felt that they would do little to ensure future peace and democracy in the world. Anger and disappointment were widespread. The Republican Party had the advantage of not having been responsible for America's role in World War I. In 1920 the Republicans nominated U.S. senator Warren G. Harding (1865–1923) of Ohio as their candidate for president. The Democrats nominated Ohio governor James Cox (1870–1957). His vice presidential candidate was Roosevelt. It was a doomed run for office, but in one respect it was a beginning rather than an ending for Roosevelt. He had covered the nation by special trains, speaking many times a day and meeting local leaders everywhere. Roosevelt and Cox were easily defeated, but Roosevelt emerged as the leading figure in the Democratic party. After his run for vice president, Roosevelt returned to work in New York City's financial district. But in the summer of 1921 he became mysteriously ill. His disease, which was not immediately diagnosed, was poliomyelitis. Often called simply polio, this infectious disease is caused by a virus and can lead to paralysis. Roosevelt became almost totally paralyzed as a result of this illness. He would never be able to use his legs again, which might have ended his political career. However, Eleanor and Franklin Roosevelt's friend Louis McHenry Howe (1871–1936) set out to renew Roosevelt's ambition. Roosevelt's struggle during the next few years was very difficult and disappointing. He did exhausting exercises to reactivate his paralyzed muscles. In 1923 he tried the warm mineral waters of Warm Springs, Georgia. Roosevelt invested a good part of his remaining fortune in Warm Springs, and it soon became a resort for those with similar ailments. While at Warm Springs in 1928, Roosevelt was called to political duty again. Al Smith (1873–1944), the four-time governor of New York, was now running as a Democratic candidate for president. Although it became clear that Smith could not win the national election, Smith felt that Roosevelt, as a candidate for governor, would help to carry New York. Roosevelt resisted, feeling that if he lost the race for the governorship he might lose his own chance to become president. Nevertheless, he ran and was barely elected. Roosevelt now began the four years of his New York governorship that led to his presidency. By 1930, it was clear that he should be the Democratic candidate for president in 1932. Since 1929 the nation had been struggling in the Great Depression, the worst economic depression of its kind in history, and the Republican administration of then-president Herbert Hoover (1874–1964) had failed to find a way to help the country recover. Roosevelt was elected president in 1932. He came to office with a dangerous economic crisis at its height. Some 30 percent of the work force was unemployed. Roosevelt began providing relief on a large scale by giving work to the unemployed and by approving a device for bringing increased income to farmers. He adjusted the U.S. currency (the American money system) so that those in debt could pay what they owed. Banks that were closed all over the country were helped to reopen, and gradually the crisis was overcome. In 1934 Roosevelt proposed a national social security system that, he hoped, would prevent another such depression. Citizens would never be without at least minimum incomes again, because the new social security system (still in use today) used money paid by employees and employers to provide support to those who were unemployed, retired, and disabled. Many citizens became devoted supporters of the president who had helped them. Roosevelt became so popular that he won reelection in 1936 by an overwhelming majority. Roosevelt's second presidential term began with a battle with the Supreme Court. The justices of the court had considered some of his economic programs to be against the principles of the U.S. Constitution. Roosevelt tried to fight the court by adding new justices who would be more accepting of his policies. However, many even in his own party opposed him in this attempt to pack the court, and the Congress defeated it. After this disagreement, relations were suspended between Roosevelt and the Congress. 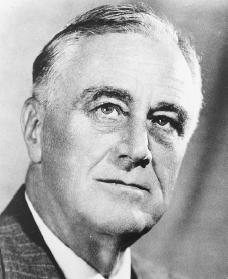 Nevertheless, in 1940 Roosevelt ran for a third presidential term. He was now certain that the leader of Nazi Germany, Adolf Hitler (1889–1945), intended to conquer all of Europe. Roosevelt saw that Europe would fall unless the United States came to its support. The presidential campaign of 1940 was the climax of Roosevelt's plea that Americans set themselves against the Nazi threat. Many Americans remembered their disappointment after World War I, and many also leaned toward supporting the Germans rather than the group of countries known as the Allies (including Great Britain, France, and the Soviet Union). The Allies opposed what were known as the Axis Powers—Germany, Italy, and Japan. The American people were so unwilling to be involved in this war that by the end of his campaign Roosevelt practically promised that young Americans would never be sent overseas to fight. Roosevelt narrowly won the election. He was not far into his third presidential term when the decision to enter the war was made for him. On December 7, 1941, the Japanese attacked the Pearl Harbor naval base in Hawaii, causing serious losses to American forces. At once the White House became headquarters for those who controlled the strategy of World War II. British Prime Minister Winston Churchill (1871–1947) practically began living there. Together the leaders agreed that defeating Germany and Italy was the first priority, rather than focusing on the threat posed by Japan. Hitler's strategy was to defeat the Soviet Union, conquer North Africa, and link up with the Japanese in the East. Roosevelt wanted to retake France, which had been occupied by Germany, and to force Hitler to fight on two fronts. Churchill, however, wanted to attack lower Europe, cut Hitler's lines to the East, and shut him off from Africa. The invasion of Europe was postponed, but Allied troops were sent into Africa. Eventually these forces crossed to the island of Sicily in the Mediterranean Sea and made a slow march up the Italian peninsula. At the same time, Allied troops landed on the beaches of France. The twin attacks forced an Italian collapse and the German surrender. Meanwhile, American general Douglas MacArthur (1880–1964) drove the Japanese back and destroyed their fleet in the Pacific. After the German surrender, the war came to an end with the American atomic bomb explosion over the Japanese cities of Hiroshima and Nagasaki. The decision to drop the bombs was not made by Roosevelt, but by the man who followed him, President Harry S. Truman (1884–1972). Although Roosevelt was elected to a fourth term in 1944, he died before World War II ended. He had gone to Warm Springs in 1945, completely exhausted after having returned from a conference of Allied leaders to set the terms for final peace. At the conference, he had forced other leaders to accept his scheme for a United Nations. On April 12, 1945, he suffered a fatal stroke when an artery ruptured in his brain. Alsop, Joseph. FDR, 1882–1945: A Centenary Remembrance. New York: Viking, 1982. Reprint, New York: Gramercy Books, 1998. Burns, James MacGregor. The Three Roosevelts: Patrician Leaders Who Transformed America. New York: Atlantic Monthly Press, 2001. Freedman, Russell. Franklin Delano Roosevelt. New York: Clarion Books, 1990. Larsen, Rebecca. Franklin D. Roosevelt: Man of Destiny. New York: Franklin Watts, 1991. Leuchtenburg, William E. The FDR Years: On Roosevelt and His Legacy. New York: Columbia University Press, 1995. Schlesinger, Arthur M., Jr. The Age of Roosevelt. 3 vols. Boston: Houghton Mifflin, 1957. FDR was not an only child. He had at least one half-brother. How did FDR disappoint many african americans during the Great Depression? Comment me back please i would like to know!